[Outline] Wakayama Ryujin @Ryujin-mura, Tanabe He is surprised at an as smooth as boiled egg 3 [ Japanese ] beautys Touji, and in the next morning, and it is a ground of an unexplored region. 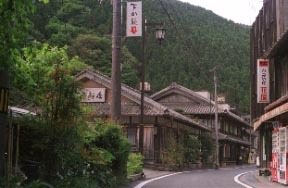 It is the hot spring of the deepest part and a mountains national road which wells ups to an enough unexplored region previously also in Kii Peninsula and Wakayama-ken which were blessed with the altitude of about 600 m, and nature.It is like [ which was loved as "3 / Japanese / beauty's hot spring" along with Gumma Kawanaka and Shimane Yunokawa, and was surprised at the as smooth as boiled egg of the day following myself ].Therefore, it is an emotional hot spring resort, being on the ground which it is popular, and there is 1300 years of history, and is called unexplored region.It is in the foot of a mountain of the prefectural highest peak "1376 m of Gomadan-zan", and ayu fish angling and a branch are prosperous in red-spotted trout fishing in Hidaka-gawa.Rhododendron metternichii var. 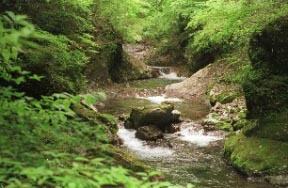 pentamerum was in all glory in [ brilliant ] on the Komoriya nature trail to the Omangafuchi. Please go out via Gomadan-zan together with the Koyasan visit. The Koya ryujin skyline became no charge. 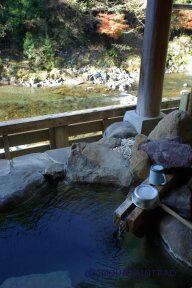 It visits for the second time solemnly via Koyasan of 2010/11/27, and night. A wooden yuyado is a remain. 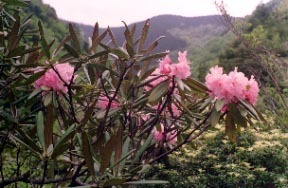 "The Komoriya ravine, the waterfall of a white slow stream"
Rhododendron metternichii var. pentamerum is a ridge before a slow stream in the middle of an April. 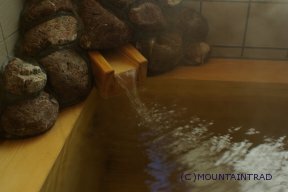 Powder was thrown away into the white slow stream, they threw away rouge into the waterfall of a red slow stream, and the postmortem of a Taira no Koremori and the lover Oman threw themselves into the slow stream. 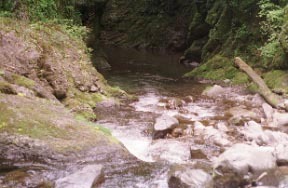 Komoriya ravine nature trail: It can go back and forth to an Omangafuchi in about about 2 hours. It is a good-location-to-see Arinokiya open-air bath about a ryujin river. * The mountains national road R425 from Nara and Totsukawa is narrowed many [ fall accident ], and is careful of the whom who along which it passes.